Hi all, I am sorry for the late post today, I was waiting to see if anything official came out about Rose and or Beasley. Alas, at 1:58 on Monday afternoon I think it is safe to assume we won't be hearing anything today. I am going crazy waiting to hear or see anything on who Converse has signed from this years draft. It's a good thing I've at the Championships Wimbledon to help pass the time today. So I decided to go with a Tennis Ad for today's post. Below is the whole ad, followed by larger views of the ad in parts. Since 1919, the game, the clothes, rackets, balls…all have changed. Names and fads have come and gone. But one thing has been consistent: the Star trademark on our shoes still indicates a shoemaker whose basic goals have been to give an athlete the best support and fit possible. The fact is we think we put more protection under foot, have an excellent weight/support ratio, and develop style that considers comfort as well as good looks. The ’74 edition of our tennis All Star reflects all of this. New styling, in suede, smooth leather, and canvas uppers, padded ankle collars, lace-to-toe and U-throat models, light weight soles, and more styles for women including a new blue suede model. If you aren't playing in Converse already, take a step on the right sole and in the direction of a more enjoyable game. Get into Converse and see how a star performs on the court. While the ad offers a lot of details about the new tennis shoes, it also has a pretty ridiculous run on sentence. 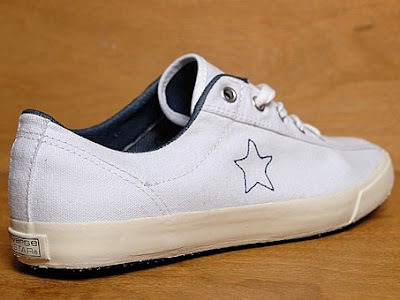 I have seen the pair on the top right, with the out lined star, re-issued by Converse. You can find them at Size?, which is where this picture below came from. Thanks for stopping in and checking out the blog. I hope to break in with some news on Rose and Beasley soon. Keep checking back for those updates. The Converse Blog: Converse Mini Websites. 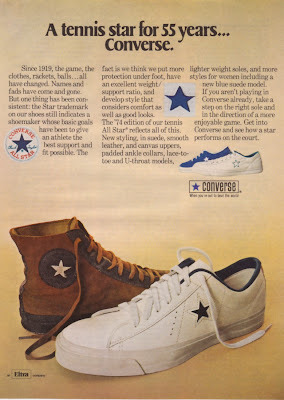 The Converse Blog's Friday Flashback: Jogging. The Converse Blog's Weapresent Weapon Wednesday!